S I G N & D I G I T A L G R A P H I C S • May 2018 • 51 ters, airports, hospitals, universities, casinos, hotels, movie theaters, galleries and museums. They are used as part of shelving systems and displays, to enhance signs, directories and donor walls, and emphasize exhibit artwork and artifacts, from prints to heavier objects like rugs and three-dimensional art. 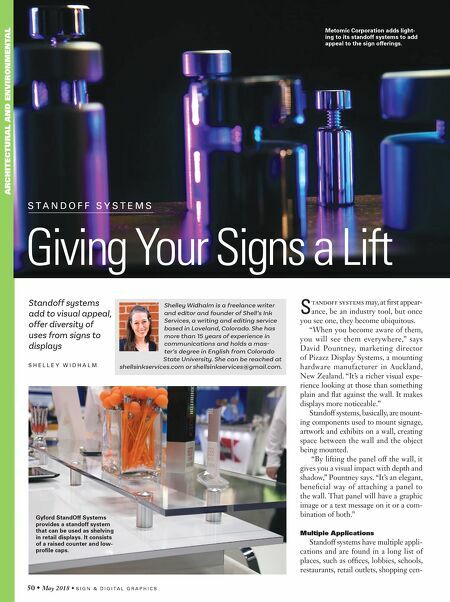 "When someone walks into a room or a company's lobby or headquarters, they kind of scan the area without knowing it," says Chris Howard, marketing coordinator of Gyford StandOff Systems, a manufacturer of mounting hardware in Reno, Nevada. "A lot of times what they see will add to their overall perception of the qual- ity of the company." That's because standoffs give a finished and professional look to a sign or display item, Howard says. "It's a higher level of design," Howard says. "It definitely looks more professional than just throwing a screw in. They add to the sign and overall look of the space or room you're in." The professional look comes, in part, from the barrel and cap, the mounting device or hardware for the standoff system. The barrel typically is cylindrical in shape and functions as a spacer between the two panels, pushing the second panel out from the first. The cap is on the exterior of the second panel and screws into the threads of the barrel, securing everything into place. 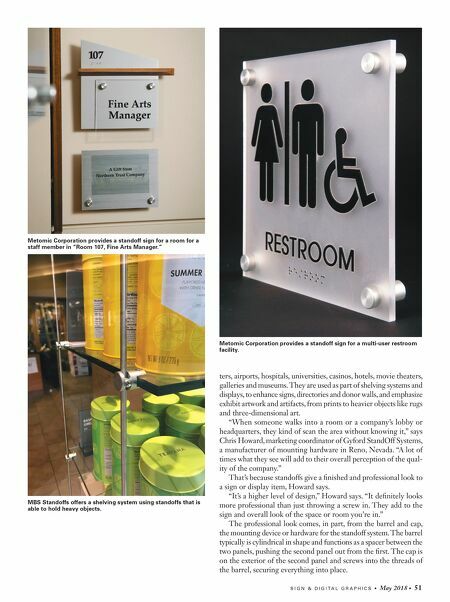 Metomic Corporation provides a standoff sign for a multi-user restroom facility. Metomic Corporation provides a standoff sign for a room for a staff member in "Room 107, Fine Arts Manager." MBS Standoffs offers a shelving system using standoffs that is able to hold heavy objects.